Hitachi Healthcare introduced a range of products for CT and ultrasound this past week at the European Society of Radiology in Vienna Austria. Among its new solutions was the standard version of its 64/128-slice CT scanner, the SCENARIA View, a whole-body CT scanner which made its debut at the event and is now available for sale alongside the advanced version, which was recently displayed at the 2018 Radiological Society of North America this past November in Chicago. Designed with an 80-centimeter bore, both the standard and advanced version can assess different-sized patients, and both are equipped with a broad range of clinical applications, including ones for high-dose reduction. The Japanese healthcare giant also launched a new set of ultrasound systems, three of which are ARIETTA 65, ARIETTA 50 and ARIETTA 50LE (Limited Edition). 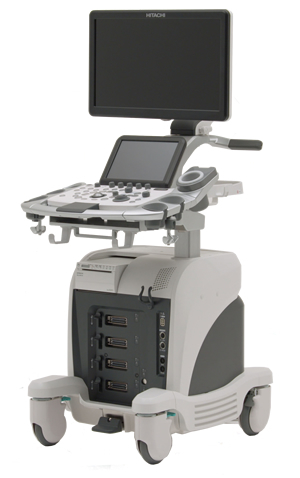 A mid-range product, ARIETTA 65 is based on the design of Hitachi’s premium ultrasound system, including its 21.5 meter monitor and four connectors, but is meant as a more cost-efficient solution for providers who do not require all of the premium version, which offers 3D, fusion, contrast and elastography in real-time capabilities, among others. It also has fewer buttons on its keyboard, offering a simpler workflow for improved throughput and optimized productivity for reduced scanning time. ARIETTA 50 is designed with minimum features to ensure easy use among beginners, and provide a simple workflow. It is composed of a big screen, three connectors and a fixed monitor arm, as well as contrast and basic features such as B-mode and color mode. The three are now available for sale in Europe.